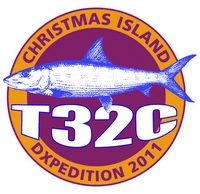 I don’t know exactly why, but I’ve had a bit of an obsession with the T32C DXpedition to Kiritimati since they got started a few weeks ago. Maybe because I found them easier to work than many of the DXpeditions that I’ve tried before. The fact that they are a very well-run operation has something to do with it, I’m sure. Whatever the reason, once I got a few contacts under my belt, I became driven to try to work them on all band slots practical for CW and SSB. I have a ZS6BKW antenna, so I can load it up from 10 to 80 meters. I figured 10 — 80 was a reasonable goal, but I knew the lower bands were going to be tougher since my antenna is only up at about 30 feet. With the bands being as hot as they have been in the last month or so, it hasn’t been a great challenge to fill up the band slot chart for the most part. Almost all of the QSOs made over the last few days have been snagged within one or two calls (I also thank W9KNI’s book The Complete DXer for teaching me very valuable basic DXing skills). I will admit that I’ve been running 100 W output for these QSOs — with one important exception. 20 meters CW was one of the slots that I had not yet filled as of this morning (oddly enough, since that’s THE DX band). Over the last few weekends, I’ve been hacking away on the firmware to the CC-Series, trying to get the last major features up and working bug-free. Thanks to a request from AA7EE, I just implemented XIT on top of the RIT that was already in the firmware (speaking of Dave, go check out his even more impressive T32C QRP story). The nice thing about XIT is that it allows you to relatively easily work split stations like DX, even though there is no “official” dual-VFO capability in the rig. Since the XIT capability seemed to be mostly working correctly, I wanted to put the CC-20 on the air to try it out and be certain. The first station that I worked today with the CC-20 was K6JSS/KL7, operated by well-known Alaskan QRPer AL7FS. It was a simplex QSO, but it was nice to bust the mini-pileup with my first call. While continuing to work on CC-20 development, I monitored the DX cluster to see when T32C would show up on 20 meters. Sure enough, I ended up seeing him pop up on the cluster at about 0200 UTC. Time to put the CC-20 to the test. I don’t have a valiant battle to describe. It took me about 10 calls to finally get him, although there weren’t a lot of people calling him. I suspect that the majority of my trouble in getting him was in zero-beating him with the unpackaged encoder knob. While in RIT or XIT mode, pressing in the tune knob toggles between the TX and RX VFOs. Trying to do that quickly when it’s not mounted on a chassis is tricky! Regardless, it didn’t take long until I heard the sweet sound of my callsign coming back to me across the vast Pacific Ocean. Two watts spanning 3600 miles to a tropical island in the middle of a huge ocean is pretty neat. This doesn’t rank in the annals of great QRP achievements, but it will always be a memorable QSO for me. Nice work Jason! The essence of ham radio, fiddling with rigs and working the DX with what you have on hand. Hope you have a nice Fall up there. Up until 2008 I lived in Hillsboro since about ’86. There is indeed something magical about a signal from a small island winging it’s way over all that water towards us. I’m very glad that you got to contact the T32C team with the CC-20. You should definitely apply for that 1,000 miles per watt award now Jason. I can’t think of a more fitting occasion on which to do it! Sounds good, Jason – with your and Dave’s accomplishment with this rig, my Photoshop-inclined mind is already thinking of a suitable photo to accompany the ad! I’m glad the rig will have XIT…looking forward to its further development. John, thanks for stopping by! Work on development proceeds at a good clip, and with any luck Beta 2 will be ready to go in about four weeks. Stay tuned! Congrats and well done with the T32C QRP QSO. I too have been chasing them, but sadly QRP is out of the question due to the huge distance between us. They are almost antipodal to us here in South Africa. I recon I will be bugging you soon for one of your kits, I love QRP and homebrew. And allow me to say that I haven’t seen your blog before today, but I like it! Glad to hear that you are interested in the CC-Series. Stop by any time and comment!